Marla teaches groups and individuals of all ages and all levels of experience. Classes range from 90 minutes to three hours and can be held in her professional kitchen, your home, church, synagogue, clubhouse or community center. 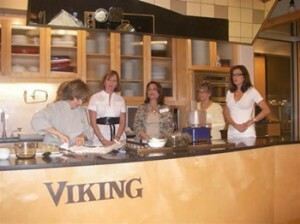 During her career as a chef, caterer and consultant, Marla Mendelsohn has taught cooking as part of curriculum for The Kitchen at Bed, Bath & Beyond (NJ), King Supermarkets (NJ), Viking Culinary Art Center (NY, NJ and TX), Central Market (TX), Loaves and Fishes (NY), Classic Thyme (NJ), and privately to corporations and law firms for team building and to individuals for social entertaining purposes (birthday and anniversary celebrations, bridal showers). Marla enjoys teaching classes for groups and families (adults, teens, children and mixed aged groups, handicapped children and adults) as well as one-on-one personalized instruction.